This blog was originally posted in 2017, but was updated in February 2019 for accuracy! Get ready for a good, old fashioned New Orleans block party! Whitney White Linen Night will return to the Warehouse District on Saturday, August 3rd, 2019. Sponsored by Whitey Bank, Whitney White Linen Night is a chance for the Warehouse District, which has distinguished itself as being New Orleans's art epicenter, to show off NOLA’s thriving art scene. In the closed-off 300 to 600 blocks of Julia Street, three stages are set up for live entertainment featuring some of New Orleans' top bands. This year’s event features over 20 galleries and museums, as well as food and cocktails from 25 local restaurants. From 5:30 to 9:30 p.m. the art galleries on or adjacent to Julia Street will open their doors to art aficionados and casual strollers alike. 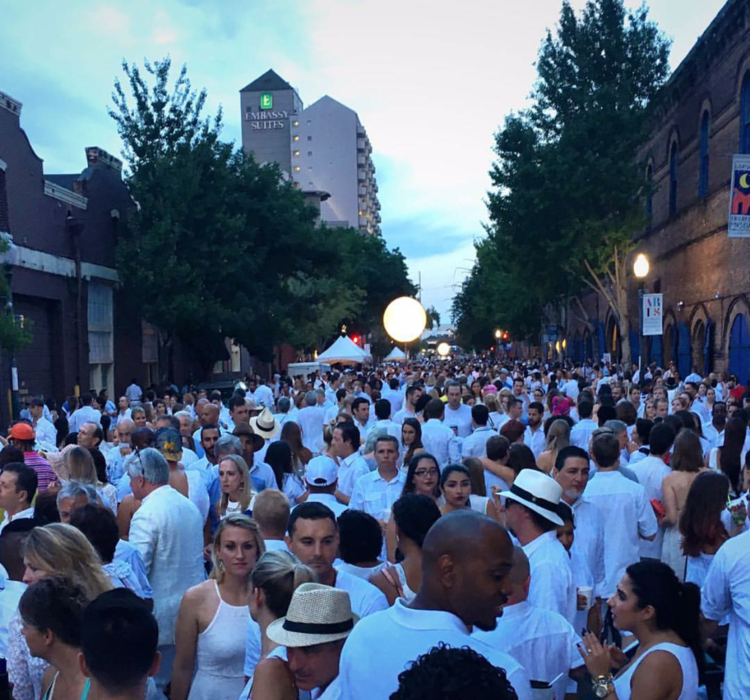 Those who turn out for Whitney White Linen Night are encouraged – but not required – to wear as much white attire as they can. White linen was chosen both for its breeziness and because traditionally, white linen suits and similar attire are not worn after Labor Day. If you don't have white attire, that's okay! Any combination of light apparel will do. For centuries New Orleanians have been wearing white linen to beat the heat. Men wore white suits and hats to reflect, rather than absorb, the sun's rays, and women wore white dresses and hats. Following the 1984 World's Fair in New Orleans, a massive urban renewal initiative began transforming abandoned and neglected warehouses into lofts, condominiums and – especially – art galleries. In the early 1990s, owners of the art galleries, centered primarily on or near Julia Street, brainstormed about ways to attract potential art buyers into the area. They came up with the idea of reviving the old summertime white linen tradition and the first White Linen Night was held in 1994. Its success took off from there and the event has grown steadily in popularity and attendance ever since.